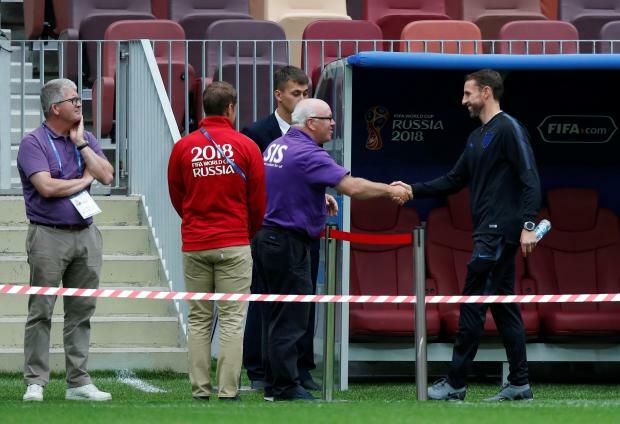 England manager Gareth Southgate shakes hands with head groundsman Alan Ferguson on the pitch. A petition calling for a bank holiday if England wins the World Cup has gathered tens of thousands of signatures. The appeal on the Parliament website said a bank holiday is needed because if England are victorious then Monday will "not be pleasant" for fans. Parliament considers all petitions that get more than 100,000 signatures for a debate, and as of Tuesday afternoon the petition had more than 140,000 signatures. CBS Sports says that England is 11-4 to win the entire tournament, while Croatia is going off at 4-1 World Cup odds to take home the trophy.